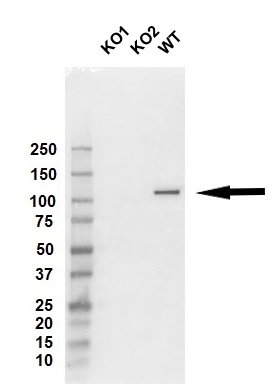 Western blot analysis of control and MSH2 knockout eHAP whole cell lysates probed with MSH2 antibody followed by detection with HRP conjugated Goat anti Mouse IgG (1/10,000, STAR207P) and visualized on the ChemiDoc MP with 6 second exposure. Arrow points to MSH2 (molecular weight 105 kDa). MSH2 antibody recognizes the DNA mismatch repair protein MSH2, also known as hMSH2, mutS homolog 2 or colon cancer, nonpolyposis type 1. This antibody has been extensively validated for western blotting using whole cell lysates. Mouse anti Human MSH2 antibody recognizes the DNA mismatch repair protein Msh2, also known as DNA mismatch repair protein Msh2, hMSH2, mutS homolog 2 and colon cancer, nonpolyposis type 1. This locus is frequently mutated in hereditary nonpolyposis colon cancer (HNPCC). When cloned, it was discovered to be a human homolog of the E. coli mismatch repair gene mutS, consistent with the characteristic alterations in microsatellite sequences (RER+ phenotype) found in HNPCC. Two transcript variants encoding different isoforms have been found for MSH2 (provided by RefSeq, Apr 2012). 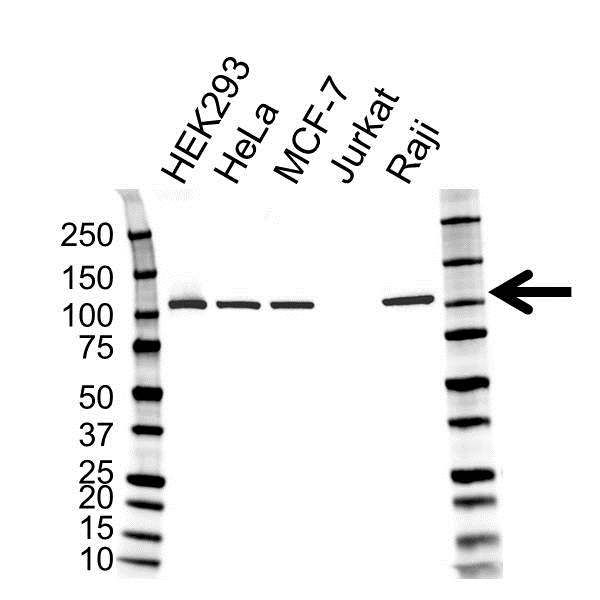 Mouse anti Human MSH2 antibody detects a band of 105 kDa. The antibody has been extensively validated for western blotting using whole cell lysates.